Millions of Americans now pop omega-3 supplements as routinely as they shower and brush their teeth. And with good reason. Omega-3s help fight everything from arthritis and depression to macular degeneration and high triglycerides. Omega-3s are essential fatty acids. As such, these nutrients cannot be manufactured by the body, so they need to be obtained from foods or supplements. As with most nutrients, it’s preferable to get your omega-3s from food, which also provides a slew of beneficial vitamins and minerals. For example, the richest omega-3 food sources, including oily fish such as salmon, sardines and trout, are also high in immune-supporting vitamin D and selenium. What you may not know: Getting enough omega-3s from one’s diet is tough. In fact, the US Dietary Guidelines Advisory Committee has estimated that about 70% of Americans are deficient in this crucial nutrient. Unless your daily diet includes marine sources of omega-3s, such as oily fish, you should consider taking omega-3 supplements. Walnuts, flaxseed and other plant sources have the omega-3 alpha-linolenic acid, which the body does not convert very efficiently to eico­sapentaenoic acid (EPA) and docosahexaenoic acid (DHA)—the two main types of omega-3s. Therefore, plant foods don’t provide nearly as much of these crucial omega-3s as do the fish listed earlier. My advice: Take two 1,000-mg capsules of fish oil daily (at least 400 mg of EPA…and 200 mg of DHA in each capsule). ** Good product for general health: Jarrow Formulas’ EPA-DHA Balance. This is a highly concentrated, purified fish oil (made with anchovies and sardines), produced by a reputable manufacturer. When larger doses of omega-3s may be Needed: Individuals who suffer from severe rheumatoid arthritis or who have heart disease should eat seafood at least twice a week. In addition, the National Institutes of Health recommends that rheumatoid arthritis sufferers get 3.8 g- of EPA and 2 g of DHA daily via supplements…those with heart disease should get up to 6 g of EPA and up to 3.7 g of DHA daily. Caution: Taking 3 g or more daily of omega-3s may cause excessive bleeding in some people, so this much fish oil should be taken only when recommended by a physician for a specific purpose. To avoid taking multiple capsules, consider trying a pourable variety of omega-3s—a single teaspoon contains about 2 g of omega-3s, which is the equivalent of two 1,000-mg capsules. Liquids are generally more cost-effective, too. If you’re worried about the taste of an omega- 3 liquid: Try a flavored fish oil (such as lemon, orange or mint) or mix your omega-3 dose in orange juice or pineapple juice. Good liquid omega-3 products are available from Twinlab and Nordic Naturals. If you’re allergic to fish or you are a vegetarian: Many algae-based omega-3 products are available. DSM Nutritional Products makes life’sDHA, which is a highly purified and concentrated source of DHA (available at lifesDHA.com). What about krill oil? This omega-3 product is derived from krill—tiny, shrimplike crustaceans that are normally eaten by whales, penguins and seals. Some people find that krill oil helps relieve joint pain faster than fish oil does. Good krill oil supplements are available from Twinlab, Jarrow, Nature’s Way and Natrol. 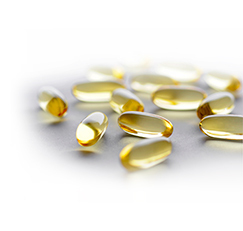 A final point to consider in choosing an omega-3 supplement is the quality of the manufacturing process. To ensure that the company is complying with high manufacturing standards, choose omega-3 products that are labeled with the Good Manufacturing Practices (GMP) certification. This certification, granted by the Natural Products Association, shows that the company’s manufacturing facility has been inspected every two years by an independent third-party auditor who checks production processes and that the product meets specifications in such areas as purity and strength. For a list of GMP-certified companies, go to the Web site of the Natural Products Association, NPAinfo.org. An Alternative to look for: Certification from NSF International, an independent testing organization, NSF.org, indicates that an independent accredited lab has confirmed that the product contains what is on the label and on-site inspections have been made at the manufacturing facility. There are two main types of omega-3 fatty acids—eicosapentaenoic acid (EPA) and docosahexaenoic acid (DHA). Each of these fatty acids plays a different role in keeping our bodies healthy. EPA inhibits a key enzyme that fuels the production of inflammatory hormones. As a result, it is slightly more effective than DHA against certain types of inflammatory conditions, such as arthritis and joint and tendon problems. DHA, on the other hand, will boost the health of your brain’s neurotransmitters. For the greatest benefit: It’s wise to choose an omega-3 supplement that contains both EPA and DHA. Just as calcium and vitamin D work synergistically, so do EPA and DHA. * Dr. Broadhurst has been a consultant in the natural products industry but has no financial interest in any of the products mentioned in this article. ** Consult your doctor before starting an omega-3 regimen.